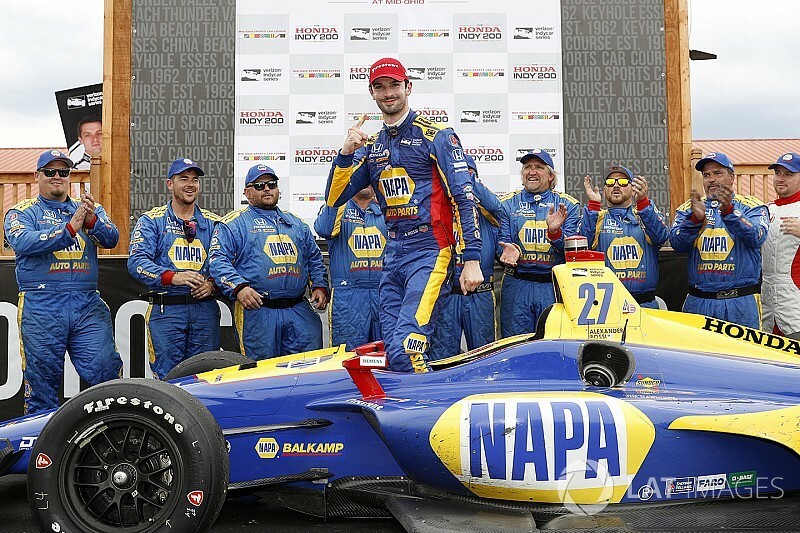 Alexander Rossi and Andretti Autosport made a two-stop strategy work in a caution-free Mid-Ohio IndyCar race, as rookie Robert Wickens led the three-stopping cars to claim second. Rossi made a strong start from pole with Will Power tucking in behind, moving to the right to protect the inside from Ryan Hunter-Reay, and Hunter-Reay had to back off, allowing Newgarden around the outside to claim third, with Wickens holding position in fifth. Takuma Sato, who’d jumped his Rahal Letterman Lanigan Racing-Honda ahead of Max Chilton’s Carlin Racing-Chevrolet, but a retaliatory move by Chilton saw the two made contact in Turn 5, spinning the RLLR car to a halt. Chilton’s glorious sixth place on the grid went to waste as he dropped to the back, while Sato fell to 17th. Behind Scott Dixon’s Chip Ganassi Racing Honda in sixth and Graham Rahal (RLLR-Honda) in seventh, Jordan King had benefited from the confusion caused by Sato’s spin, and had weaved his Ed Carpenter Racing-Chevy through to eighth, having started 16th. Another man on the move was Simon Pagenaud in the third Penske-Chevrolet, moving up to 11th by Lap 12, ahead of Conor Daly’s Harding Racing-Chevrolet. Marco Andretti, who’d started on scrubbed reds, pitted on Lap 13 for fresh reds. Hunter-Reay was the first of the leading runners to pit, with Wickens, and King following suit the following lap. A strong stop from Schmidt Peterson ensured Wickens emerged ahead of RHR, who’d now switched to blacks. A lap before Hunter-Reay, Rahal and Pagenaud had pitted for scrubbed reds and fresh reds respectively and had emerged in eighth and ninth with all cars ahead yet to stop, although they were 34 and 36 seconds off the leader. However, Rahal didn’t help his cause by running wide out of Turn 1 immediately after setting his fastest lap to date. Power and Newgarden had closed onto Rossi’s tail by Lap 23, as the leader found himself held up by Jack Harvey in the Meyer Shank Racing-Honda. As the three were bottled up behind Harvey, and their times dropped by a 1.5sec, Penske called Power in. Newgarden, meanwhile, dived down the inside of Rossi at Turn 4, but then Newgarden and the by-now closely following Dixon pitted for blacks. As they exited pitlane, Power and Hunter-Reay whipped past, and Wickens on red tires and on a three-stop strategy, like Hunter-Reay, had checked out in the lead to the tune of nine seconds. By the time Rossi pitted and emerged with his black primary tires, he’d fallen to fifth and had to get very defensive to hold off Dixon down into Turn 4. Right behind Dixon ran Rahal and Pagenaud, the edge taken off their red tires. As Wickens continued to stride away from Power, so the Penske driver was also having to work hard to stay clear of Hunter-Reay, who in turn was running just 1sec ahead of Newgarden. Further back, Sebastien Bourdais, who’d started on fresh blacks from the rear of the grid following his qualifying faux-pas but had then stopped early for reds, was into 10th place by Lap 37 when he made his second stop. Wickens pulled in for his second of three stops on Lap 38 having established a 14sec lead over Power, while Hunter-Reay stopped a lap later. Dixon came in just 14 laps after his previous stop, switching to scuffed reds, while Newgarden hit pitlane on Lap 42, also running a three-stopper, and emerged ahead of Hunter-Reay. Two-stopping Power and Rossi stayed out, however, running 5sec apart in first and second, with Wickens on black tires now up to third, 13sec behind his regular nemesis, Rossi, and 8sec ahead of the Newgarden vs. Hunter-Reay battle. Behind Dixon in sixth, Pagenaud was now ahead of his former Atlantic Champion rival, Rahal, while Bourdais and King completed the top 10. Surprisingly, however, Power stopped on Lap 49 – much too early for a two-stop strategy in a 90-lap race – and on cold tires he emerged from pitlane right in front of the warm-tired Newgarden. Easy meat for the reigning champion who used his push to pass to muscle down the inside of Power at Turn 2, the Aussie then immediately having to fend off an attack from Hunter-Reay. Rossi was rigidly sticking to a two-stopper and by Lap 55 of the 90, he was in the lead by 20sec ahead of Wickens, who was struggling to get around the battling lapped cars of AJ Foyt Racing’s Tony Kanaan and Sato. Rossi made his second and final stop at the end of Lap 59, having held a 24sec lead, but that wasn’t enough to stay ahead of Wickens who held a 1.8sec lead on Lap 60 and was still bottled up behind Kanaan, despite managing to claw past Sato. Finally Kanaan made the pass happen on Lap 62, but Rossi was still in the catbird seat because he alone among the top five had made his final stop. Dixon and Bourdais pitted from sixth and eighth on Lap 63, while Newgarden and Pagenaud stopped on Lap 64, Wickens and Hunter-Reay on Lap 65. Newgarden had to get very defensive to fend off Dixon trying to protect his second place, while Hunter-Reay was doing a similar job to stay ahead of Pagenaud and Bourdais. Rossi was now running a mere 1.3sec ahead of Power, but unlike the Andretti Autosport driver, the Penske driver was going to have to stop again. That stop occurred on Lap 69, and Power’s strong in laps – along with Newgarden’s earlier defensive lines to stay ahead of Dixon – allowed Power to emerge ahead and on scrubbed reds, unlike Newgarden on blacks. Power could make no impression on Wickens, running around 4.5sec behind the Canadian rookie in third, but on Lap 74 Bourdais was able to pass Pagenaud for seventh down the back straight, and the Dale Coyne Racing driver was soon hassling Hunter-Reay for sixth. However it took until Lap 84 for the pass to occur – another brave pass around the outside of the notoriously tough Andretti Autosport pilot. Over the closing laps, Power stretched away from Newgarden and started cutting into Wickens’ advantage, but ran out of time to make a serious go of it. Rossi eased off considerably in the final couple of laps, allowing his lead over Wickens to erode from 18 to 12.8sec to score Andretti Autosport's first ever win at Mid-Ohio. Wickens was 1.9sec clear of Power who was 3.3 ahead of Newgarden. Dixon claimed another top five, with Bourdais right behind after a sterling drive from the back row. Hunter-Reay only just held Pagenaud to claim seventh, while local stars Rahal and Zach Veach completed the top 10. With four rounds to go, Dixon leads the championship on 494 points, ahead of Rossi on 448, Newgarden on 434, Power on 407, and Hunter-Reay on 399.